The Golden State is the place for solar – but how do you choose among the best solar companies in California? California is by far the biggest market for solar in the entire country, with hundreds of installers across the state, so it can be hard to narrow down a list of the best solar companies in California. Of course, that’s never a bad thing. With so many different installers out there, you’re spoiled for choice. A great way to find the best solar company in California for your needs is to compare both local and national solar panel installers. A quick and easy way to do this is to get multiple estimates and quotes to find the best deals and most reputable companies in your area. Enter your zip code below to get a free solar cost and savings estimate and be matched with multiple California solar installers that service your local area. Each of these companies offers something unique, from incredible customer service to low prices to high quality equipment. Take a look at each one to see what sets them apart. And for more info on what qualifications a reputable solar company should have, keep reading til the end! Founded in 1985, Bland Solar and Air have a lot of experience installing solar power systems for both residential and commercial customers. Headquartered in Bakersfield, they also have locations in Fresno and Templeton. Bland doesn’t just focus on solar, they also supply HVAC systems as well as roofing, so if you’re looking to do some major upgrades along with your solar installation, they’d be a great choice. On top of that, they don’t use any subcontractors, preferring to use an internal installation crew, staffed with their own fully-trained and licensed employees. Instead of hiring three separate companies for your solar, roofing, and HVAC, take a look at Bland. With just a single company, there’s less opportunity for miscommunication and you’ll enjoy an easier experience. The best solar companies in California have great reviews and years of experience, and NRG Clean Power fits the bill exactly. Established in 1987, they have nearly 30 years of experience. They are based in the Los Angeles area, they also have offices in San Jose, San Diego, and Chino. NRG Clean Power not only installs solar, but can also work with you to upgrade your entire home for better energy efficiency. We consider energy efficiency upgrades (like adding insulation, upgrading to high-efficiency appliances, etc) a great partner to solar, and tackling both at the same time can do wonders for your utility bill. On top of this, they enjoy excellent reviews from previous customers. In fact, they enjoy a perfect overall score on Yelp for the San Jose area. Another long-standing company, PetersenDean was founded in 1984 by James P. Petersen, and they claim to be the largest privately-owned solar company in the United States. They are quite a large company, working in 7 states, with 10 locations across California (Sacramento, Gold River, Orange, San Diego, Santa Rosa, Santa Clarita, Riverside, Fresno, Fairfield, and Bakersfield). Like we mentioned before, California is a huge market for solar and there are dozens, if not hundreds of installers in the state. The best installers in California don’t just install solar – they can also take care of your roof and energy efficiency needs as well. However, PetersenDean takes this to the next level. They not only install solar, but HVAC, solar batteries, EV chargers, roofing, and fences. To decrease prices and shorten installation times, they’ve adopted quite a unique business model for solar. Instead of custom designing each solar installation, they have pre-made solar ‘packages’ that include a certain amount of panels. Which package you choose depends on how much electricity you use. The installers proudly installs only American-made products in their solar installations, and since 2014 they have exclusively used SolarWorld solar panels and Buy American Act compliant inverters and racking. They do not offer leases, but do offer facilitate loans for your solar installation. If you’re not familiar with Tesla, you might need to get out from the rock you’re living under. Founded by the Rive brothers in 2006 after a suggestion by their cousin, Elon Musk, SolarCity has been one of the biggest solar installers in the USA since 2013. SolarCity was acquired by Tesla Motors, and at the same time announced the introduction of several very interesting new products, including the Tesla Powerwall II and solar roof tiles. Their headquarters are based in San Mateo, but Tesla install systems across the entire US. To date, they’ve installed systems in over 300,000 homes, and they claim to provide the longest warranty terms in the industry. Tesla’s online reviews paint a pretty bleak picture of their customer service, but if you’re looking to install the Powerwall or their new solar shingles, you can go straight to the source. Tesla also reports some of the lower installation prices among the big nation-wide installers – never a bad thing. Stellar Solar have been installing solar panels on homes and businesses in the San Diego area since 1998. They’ve supplied solar power solutions to more than 6,000 homes so far, and state that most of their business comes through referrals – always a good sign of a quality company. They’re a SunPower Master Dealer and exclusively install the company’s high-end solar panels in their installations. Stellar Solar bill themselves as specialists in installing on top of tile roofs, with a streamlined system they have developed for ensuring a smooth, swift installation with no damage to any tiles. On top of all this, Stellar Solar really is one of the best solar companies in California. Readers of the San Diego Union-Tribune have voted them the best solar installer in the city six different times, most recently in 2018. Despite prices dropping over the last 10 years like apples in an autumn storm, solar panels are still a major investment. It’s worth taking your time to thoroughly research the companies available to you. Back up your investment by ensuring you pick an experienced and trustworthy installer, and don’t get caught out with shoddy workmanship or poor customer service. A little time spent researching beforehand can save you from a vast amount of stress and unnecessary costs. The licenses and certifications a solar installer should have varies between each state. In California, the main license a solar installer should have is a C-46 Solar Contractors License. To get this license, the contractor has to have a minimum of four years of experience, and pass several written examinations, including sections on Law and Business. While not required by state law, many utilities require your installer to have at least one NABCEP certified installers if you want to enroll in net metering. Your installer will know all about your utility’s requirements, so you don’t need to worry. This goes without saying, but your installer should have generally favorable reviews. Checking review sites like Yelp or Google Reviews is a very good way to get a handle on the performance of a solar installer. Often, problematic behaviors and unscrupulous activity will be revealed when you look at other people’s experiences. A common issue, for example, that we’ve seen time and again is a sharp decline in responsiveness and customer service after the contract has been signed. Of course, don’t forget, it’s the internet. Some people just get on to complain or blow a single, small issue out of proportion. It’s rare to see a company with all good or all bad reviews. Even still, it’s easy to get the general feel for the company as a whole, so don’t let a single review sway you in one direction or the other. Once you’ve shortened your list of potential installers, your next step is to give them a call to get a better feel for how they do business. They’ll usually send a salesperson out to discuss your options and create a savings estimate. Throughout the installation process, your salesperson is your best friend and go-to fixer if something goes wrong, so you need to be comfortable from the beginning with them. Reaching out to installers doesn’t bind you to any agreement, so talking to a few different companies is always worthwhile. It’s important to consider what sort of warranty will be provided with your system – not just for the equipment (solar panels, inverter, racking hardware), but also the workmanship, especially the roof penetrations. 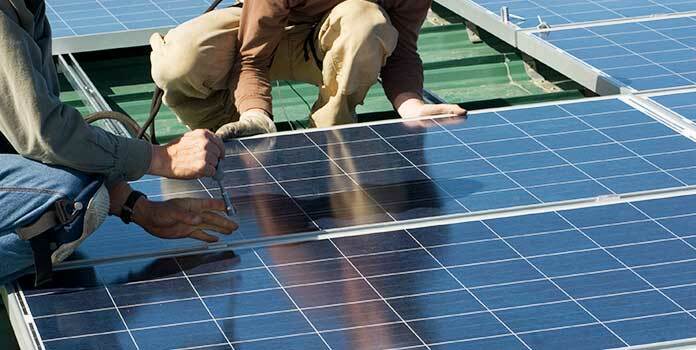 Warranties for your solar panels and other equipment are supported by the manufacturers, but warranties for workmanship are left up to your installer. The details of workmanship warranties depend on the installer and the best solar installers in California will lay out in the contract how they cover a variety of specific incidences. Before you sign any paperwork, you need to be aware of how your installer warranties against roof penetrations, leaks, Acts of God, and damage during your installation. Looking for the Best Installers in a Specific City? This is by no means an exhaustive list. With so many solar installers working in California, don’t just take our word for it! There’s likely some great local solar companies that we aren’t aware of and that offer exceptional service and good prices. Ask coworkers or friends for recommendations or get on Yelp or Angie’s List to see which installers homeowners in your area are working with. Also check out our articles 5 Best Solar Companies in San Diego and What Are the Top Solar Companies in Sacramento, CA? if you live in these areas and want some more specific recommendations. There are many installers in the state, and you should take your time researching those in your area. Oftentimes, the best solar companies in California are small, less well known installers, so it’s worth your time to choose very carefully. A great place to start is by comparing options and getting a free cost and savings estimate from several of the best solar companies in California by entering your zip code below.